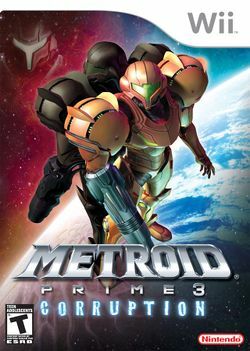 Metroid Prime 3 is considered to be a fantastic game by many. Using the Wii and Wii-mote "to its fullest", the game ends the trilogy by having fantastic boss battles, undescribable locations, and, for the first time, having full voice-over in all areas, making this a game you don't want to miss. And just in case you didn't think it didn't use online, it does. By connecting online with the Wii-mote and having your friend's Wii Friend-code, you transfer and receive "tokens" to purchase special objects, such as dioramas, in-game music, artwork, and more. This page was last edited on 13 August 2017, at 00:53. This page has been accessed 23,550 times.